Summertime wouldn’t be complete without beachy getaways, cocktails by the pool…and fresh manis and pedis, of course. Summer always gets me in the mood to use more color when it comes to picking a polish. This season, I’m leaning towards neon hues, subtle citrus tones, and a touch of sparkle. If you’re like me and are constantly switching up your manicure, then this post is for you. I’ve gathered a handful of my favorite nail polish shades that are sure to last you all season long. Let’s just say the mani/pedi combinations are endless. Peach is at the top of my go-to summer polish list. It’s the perfect touch of citrus without being too bold of an orange. Two hues that I’m currently loving are Essie ‘Resort Fling’ and China Glaze ‘Son of A Peach.’ I can’t decide which one is prettier. I’m taking a tip from Barbie on this one. Bright swimsuits have been turning up the heat this summer, so why not compliment your mani to your suit? Butter London’s ‘Fruit Machine’ is sure to turn heads. 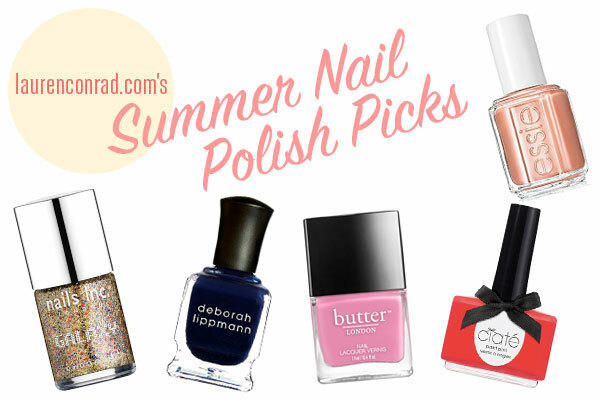 A summer nail polish roundup wouldn’t be complete with out a shade of blue. This year I’m keeping it nautical with a pop of navy. For my last LaurenConrad.com photo shoot I chose this shade. For a similar color, ‘Rolling In The Deep’ by Deborah Lippmann should do the trick! Every season calls for some variation of red! For summer I tend to lean towards warmer reds and Ciaté London has the perfect color: ‘Red Hot Chili’ is a pretty blend of coral and red, giving this color a beautiful hint of citrus. Glittered manicures aren’t reserved for the holidays anymore. Iridescent nails are making a sparkling debut this season and my team and I are ready to embrace them. Nails Inc. London ‘Galaxy’ reminds me 4th of July fireworks…and mermaids. Which nail polish color should I add to my collection? I’d love to hear your suggestions in the comments!